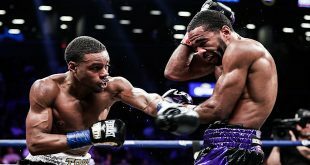 Shawn Porter and Jermell Charlo both won big fights at Barclays Center in Brooklyn, NY on Saturday night, producing fireworks that sent shockwaves in their respective weight divisions. Welterweight Porter faced Andre Berto in a battle of ex-world champions that was supposed to be a very competitive clash, but ended up as a one-sided battering. Berto started the fight looking to box from the center of the ring but Porter soon attacked his adversary on the ropes in a messy display of inside fighting. The 33 year old former two-time welter champ was floored in the second frame but managed to back Porter off for a couple of rounds with some well-timed uppercuts, but that breathing room was short lived. Porter soon abandoned boxing and the jab and once again put Berto on the ropes and used his strength advantage to nullify the Florida man's quicker hands. As Berto tried to clinch and block, the 29 year old Porter body punched, shoved, wrestled and mauled his foe incessantly. Porter's approach resulted in many headbutts, cutting both fighters above both eyes. The reeling Berto was clearly being exhausted by the combination of headbutts and punches as he was down again in the ninth. Somehow, Berto beat the count but was getting pounded in the corner by Porter, prompting referee Mark Ford to stop the contest at 1:31 of the round. With the win, Porter, now 27-2-1 (17), becomes the mandatory challenger to WBA/WBC champion Keith Thurman, who posted a narrow UD over Porter in 2016. It's amazing that Porter never had a point taken away for using rough tactics against Berto, 31-5 (24), who could potentially lodge a formal protest in order to force a rematch with Porter. 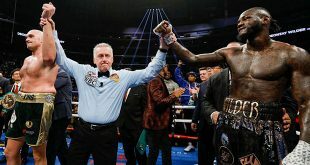 The undercard at Barclays Center saw WBC super welter champ Jermell Charlo make his first title defense against his mandatory challenger, Charles Hatley, in a composed, mature performance. Hatley earned his title shot by defeating Anthony Mundine in Australia in December, 2015 but hadn't fought since, while Charlo hadn't been in the ring for a year since stopping John Jackson to win the vacant WBC belt. Once the fight started, the shorter Hatley soon realized he'd have to take chances in order to get past Charlo's tight guard and the crafty Dallas southpaw enjoyed a bit of success with quick-handed single shots but could not avoid getting hit by a very sharp jab from the champion. By the third, Charlo was starting to nail Hatley with very hard straight right hands and soon the challenger was on the floor. Hatley was much more cautious after that, staying on his toes and looking to pick his spots. Charlo began to cut the distance between the two and Hatley was forced to open up his offense again, giving Charlo the opportunity to hammer home a perfect head shot that dropped Hatley hard in the sixth, producing a KO at 0:32 of the round. Charlo improves to 29-0 (14) and could be in line for a unification contest with either WBA belt holder - "super" champ Erislandy Lara or "regular" champ Demetrius Andrade. 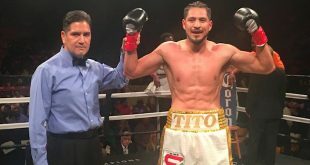 There was another big show on Saturday in the US, with a trio of WBO champions defending their belts at the StubHub Center in Carson, CA. WBO featherweight king Oscar Valez, 22-0 (19), had the toughest assignment of the three champs but handled former world title challenger Miguel Marriaga, 25-2 (21),well, dropping his rival in the tenth enroute to posting a 119-108, 118-109, 116-111 UD. Mexico's Valdez has now defended his crown successfully on two occasions and at age 26, is at the height of his considerable powers. WBO super bantam boss Jessie Magdaleno, 25-0 (18), followed up his title-winning effort last year against Nonito Donaire with a second round KO against Brazil's Adeilson Dos Santos, 18-3 (14). Dos Santos had previously won youth and regional titles at both featherweight and super bantam but the 25 year old was taking too big a jump up in competition in facing Las Vegas native Magdaleno, who could face the winner of the upcoming WBA title fight between champion Guillermo Rigondeaux and challenger Moises Flores, which is scheduled to take place in Las Vegas on June 17. WBO super middle ruler Gilberto Ramirez, 35-0 (24), put his height advantage to good use against veteran Ukrainian campaigner Max Bursak, 33-5-1 (15), winning every round on the way to earning a 120-106 UD on all three cards as the challenger lost two points for holding. After the bout, Ramirez's team reportedly challenged WBC/WBA/IBF middleweight champion Gennady Golovkin to step up in weigh and challenge their boxer, a bold move that, should that contest occur, could have dangerous consequences for Ramirez, who is inexperienced at world level.